Birding tours to Guyana generally all go to the same destinations. The primary locales are the Botanical Gardens in Georgetown, Iwokrama Forest Reserve, the Rupununi Savanna around Surama and Annai, and the savanna and riverine forest around Karanambu. Some tours visit coastal areas outside Georgetown where several specialty birds are found. A few tours also visit Dadanawa and riverine forest areas near Lethem where several very range-restricted birds can be seen. A very few tours go down the Rio Takatu and a short way along the Rio Ireng to view the near endemic Hoary-throated Spinetail, followed the next day by a drive some distance north from Lethem to see an isolated population of the endangered Sun Parakeet. Finally, river trips down the Rupununi River through a wilderness known as the Kanuku Mountains south of Karanambu usually encounter one or more Jaguars along the river as well as a number of bird species not ordinarily found in more accessible areas. Guyana is an exciting and relatively undiscovered birding destination located in northeastern South America. The diverse topography and mixture of rainforest and natural savanna has produced substantial species diversity in Guyana. About 825 species of birds have been recorded. Of those 73 are Guianan Shield endemics found only in Guyana and neighboring Venezuela, Brazil, and Suriname. Many of the remaining species are Amazonian and not found in Ecuador or southern Brazil. 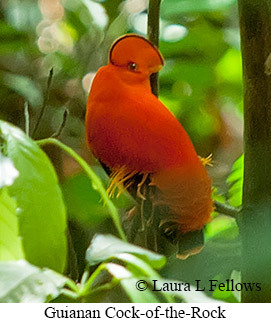 Over half the species are not found in Central America, and over 200 are not found in Ecuador.